“> Over the last week, we have been processing the final pig we butchered. All the major cuts….chops, roasts, hams, and loin are wrapped and in the freezer. The bacon is curing in its brine. A variety of savory and sweet sausage are linked or formed into patties. This morning I made scrapple using my grandmother’s old recipe. We often ate scrapple for breakfast as a kid while with her. I love it as much as bacon, and certainly more than sausage. My aunt Jane, my grandmother’s youngest daughter, who is also a fantastic cook, shared this recipe card with me a long time ago. I don’t think she’s in the habit of butchering her own pigs, but I know for certain she’d approve of all this “pork making”. If she lived a little closer, I would be sharing plenty of homemade Italian sausage with her for her well known and epic spaghetti sauce ( long before it was cool to do so, she was rolling out her own handmade manicotte dough). Scrapple is basically a mush of cooked pork scraps and trimmings combined with cornmeal and spices. It is then formed into loaves and set to chill until it firms up and congeals. Later, you can slice it and fry it……. it’s really, really good. Not kidding. It is traditional to the Pennsylvania Dutch who refer to it also as Pon Hause. We will freeze most of what we made and share some with neighbors. I know of one friend who summers on the lake and will be arriving here shortly, who will be over promptly to get his share of scrapple. Today, we will be cooking down the pig fat for lard, which by the way, was used to grease the scrapple pans. Nothing wasted. The nursery is getting some much appreciated help right now from our young friend, Emily. It’s helpful when your son has a cool girlfriend who wants to learn about plants and growing things. 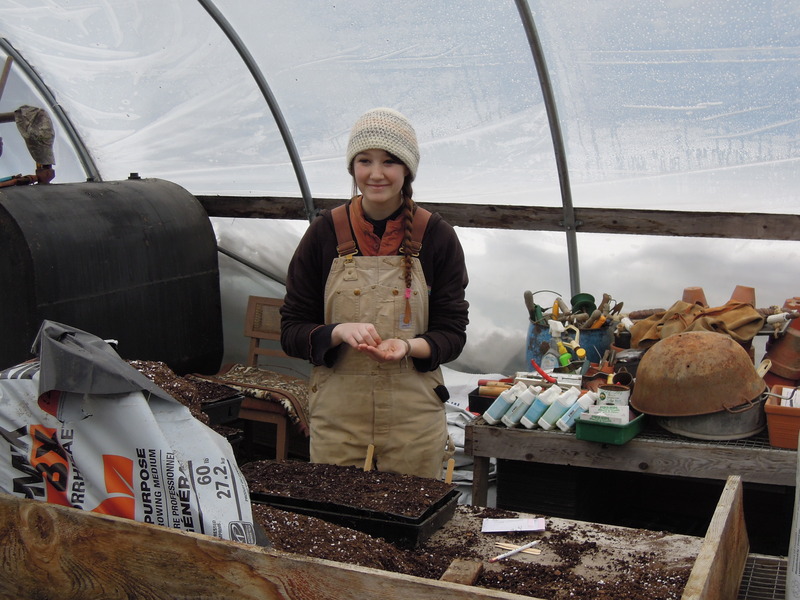 Emily has been helping in the greenhouse, filling pots and sowing seeds. Yesterday she hauled some wood and started cleaning sheep fleeces. She reminds us of Pippi Longstocking. She’s smart and strong and has a good head on her shoulders. And she’s funny. When she isn’t wearing her Carhart overalls, she sports an eclectic wardrope of funky leggings ( even some stripes and mismatched socks, like Pippi), skirts, usually a thrifted wool sweater,and tall rubber boots( turned down). She’s “cool beans” and we are glad to have her help and company. When the kids were little and we spent hours reading aloud from chosen chapter books……Pippi Longstocking was on the top list. I’m wondering if this had anything to do with Noah choosing a girlfrind that’s independent and fiesty. I like to think so. So, with helping hands, all the peppers, tomatoes, eggplant, leek, and onion seeds have been planted. We’re getting there! Chickens have been part of this small farm since we first cleared the land. Answering to that time aged riddle, which came first, at least on this plot of ground, (and before an extensive list of almost everything else) it was the chicken……and yes, then the eggs. Our flock has grown and dwindled over the years, for different reasons. 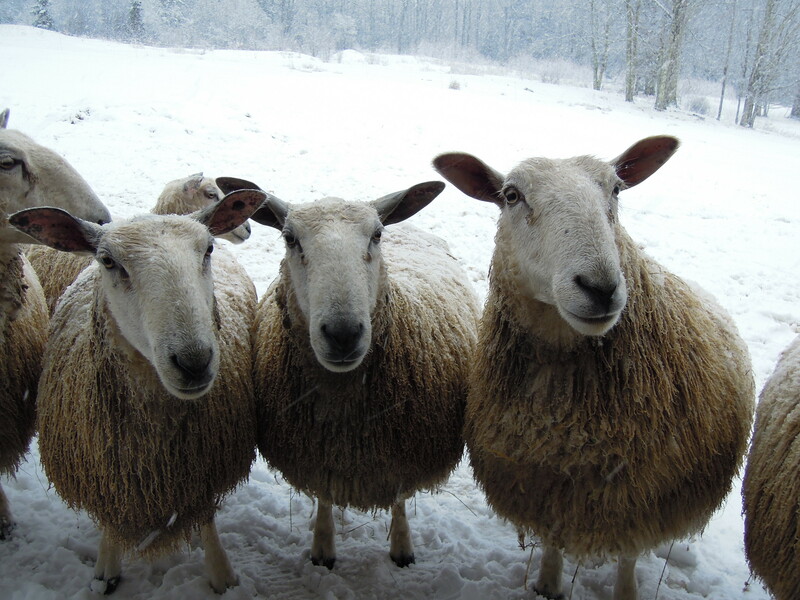 We have raised as many as 25 layers and are currently holding down the fort with a flock of 15. Some years, due to fox, weasels, old age ( the chickens, not us), or some other natural cause, we have been reduced to a flock as small as 5-6 birds. I don’t think we’ll ever be without a hen house and it’s inhabitants and 15 birds is a good number for us. Of course, every so often we must rotate out the old with the new, when our old girls stop laying and egg production drops off. I would like to tell you that by being efficient farmers, these old layers are put into the soup pot. Well, not exactly. We do raise chickens for meat, usally between 75-100 birds a year of a specific meat breed that we like called Freedom Rangers. But when it comes to “doing in ” our old layers, I balk. I am not going to write long explainations about why I find it difficult to kill the old layers, I just do. So, where do our old layers go? The hen house here is only so big and we bring younger chicks in to keep egg production up. There wouldn’t be room for everybody. Well, fortunately we have a wonderful, kind, chicken loving friend, who cares less about egg production ( don’t get me wrong, she loves and appreciates fresh eggs) and has a stellar chicken coop that any senior chicken would be happy to retire to. It’s the Taj Mahal of chicken coops, really. I wouldn’t mind retiring there myself…it’s that nice. Our old girls roam grassy pasture and bed down in luxury at my friend’s place. They spend a very comfortable retirement being oogled at and clucked to. Thank you, Sally. 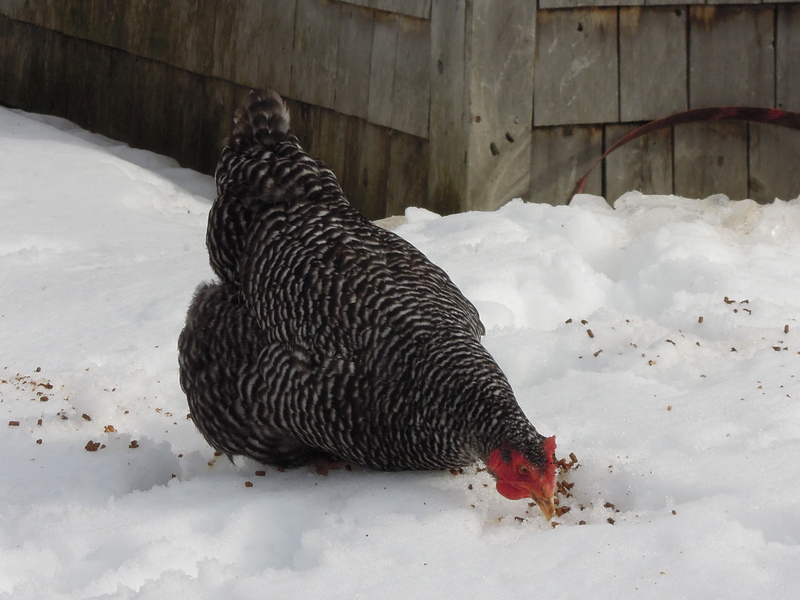 Chickens are truly every where around these parts of Maine. Years ago, when people moved away from farming and raising their own gardens, you would occasionally come across “EGGS FOR SALE” signs. With a resurgence of farmers and growers in the area, they’re harder to find now since almost every household raises a few birds, and eggs are gatherd right outside their own door. Chickens can be big conversation amongst neighbors. What breed do you have? Are you getting many eggs right now? 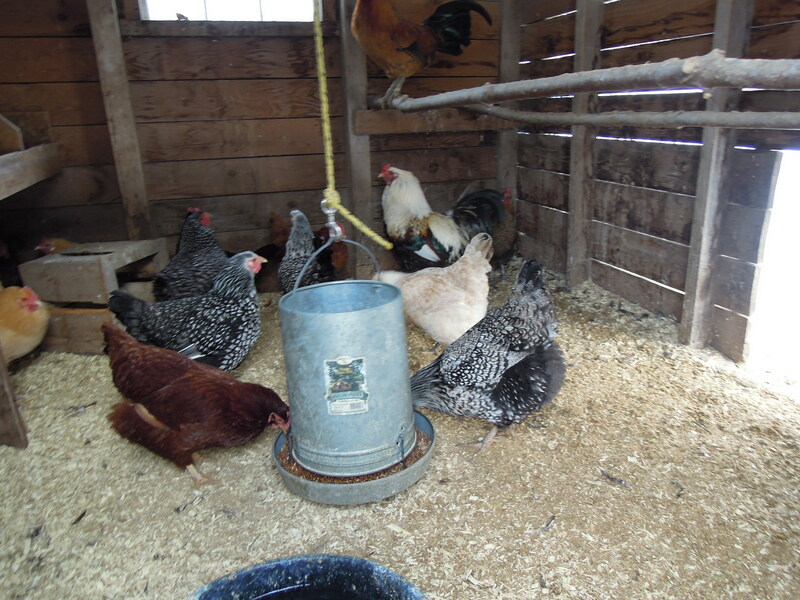 Do you put a light in your chicken coop? 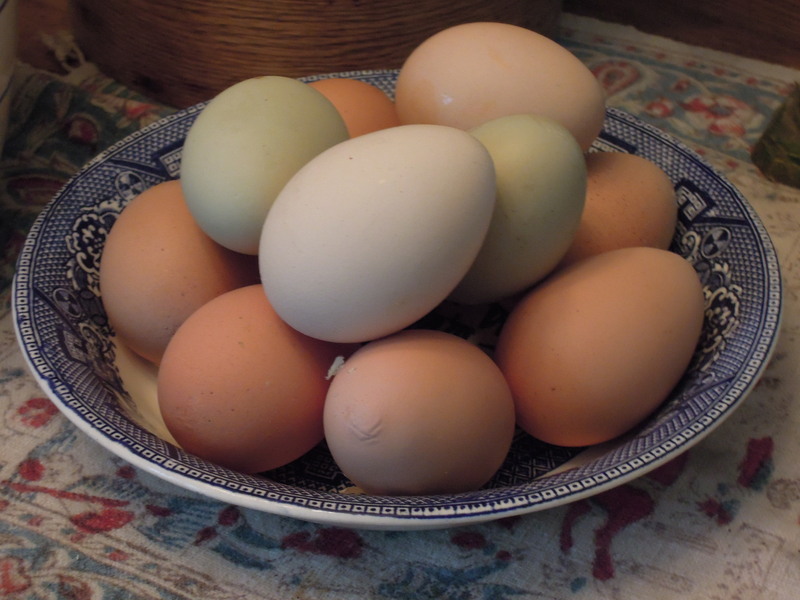 ( chickens need 14 ours of daylight to lay eggs). Do you have extra fertile eggs for sale? Do you have a rooster? Do you want a rooster?…..and so on. Our own flock is made up of several breeds. We love Buff Orpingtons. 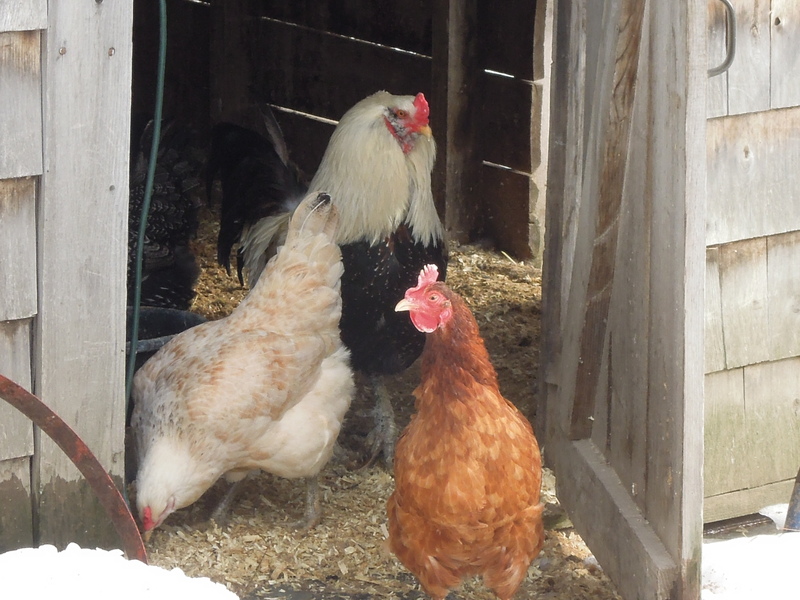 They tend to be our favorite and are a nice, docile, heavy breed of chicken and excellent layers. Barred Rock, Araucanas, and Wyandottes round out the flock. 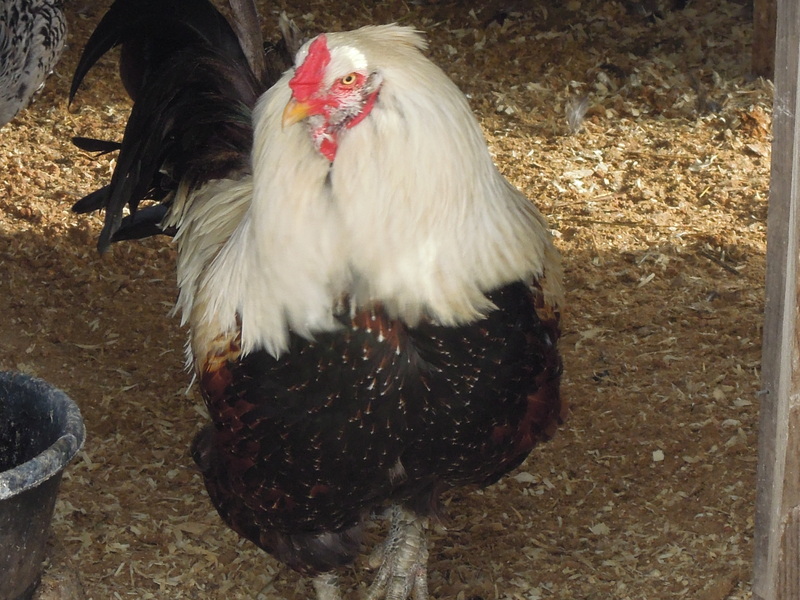 And of course, there’s Mr. Bo Jangles, our rooster, who is not only handsome to look at but one of the nicest roosters we’ve ever kept. Some roosters, because of their attitude, have a better chance of ending up in the soup pot. Don’t worry, Mr. Bo Jangles place amongst his girls, is quite secure. More than likely, chickens will always be a part of the landscape here at Fernwood. Many customers drift over from the nursery to the hen house and stand to watch the ” chicken activity”. Chickens are busy creatures, always rooting around for some soil delicacy or taking a feather bath in a dusty hollow. They’re fun to watch. They’re probably the most viewed critter of the farm. Twice a day we collect eggs from the nest boxes. Right now , we average 6-7 a day. For all those who haven’t eaten fresh eggs, there’s nothing like it. The yolks are much darker and the taste is more wholesome. Really. There is a difference. The manure we muck out of the coop gets piled and stored to later be used in the gardens. Chicken manure is quite high in nitrogen, so we let it sit for a spell before working it into the soil. Chickens earn there keep here on the farm. I cannot imagine a day that we don’t have a flock scratching around the farmyard or the early morning rooster call reminding us to start the day. Yesterday, we spent the day in the greenhouse, moving benches, sorting pots, and readying the space for the season. The sun did come out and that wonderful space did reach a temperature of about 60 degrees ( without the furnace running). Bliss, really. Indoors, trays of seeds line the windows, benefiting from both sun and wood heat. Too soon to move them into the greenhouse and subject them to March’s fickle nature. Peppers and tomatoes require real warmth to germinate, more so than some of the other seeds, like brassicas and greens. So, we continue to keep them indoors with propagation mats warming them from underneath. 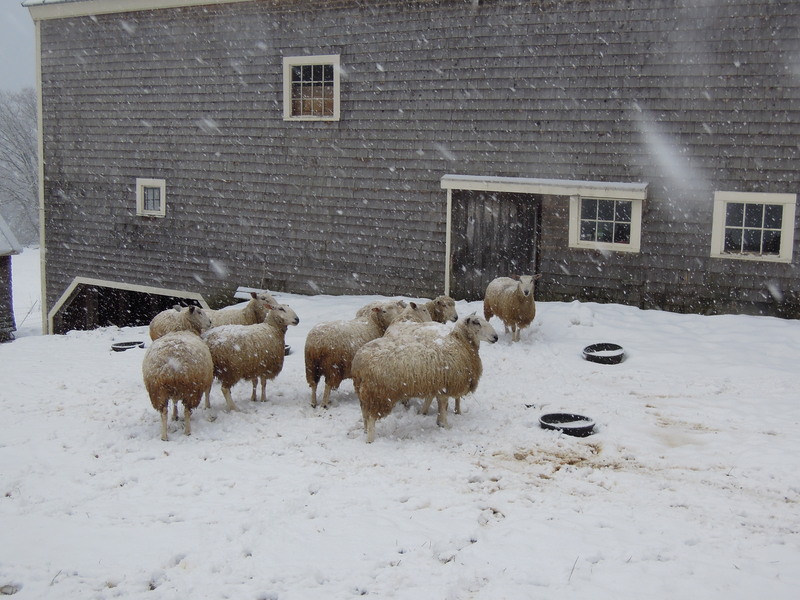 This afternoon while tending the sheep, with snow still blanketing the fields and a goood crust of ice on top, Rick and I could not help ourselves………get the toboggan and the runner sleds! Oh, the joy and the thrill of sledding. Didn’t we fly over that frozen ground! Truth be told, I did have to get after Rick every so often to stop dragging his feet and slowing us down. He is the more cautious one. The sheep watched from the top of the hill while munching their hay. They didn’t seem to be all that impresssed with these last moments of winter fun. I think fields of green grass are more likely to be on their minds. Soon enough, girls. Growing up I spent a lot of time cooking and baking with my grandmother. I almost always think of her when I am working in the kitchen, certain that she is quite responsible for my love of food and the making of it. She had an instinct for cooking. A good sense for spices and the use of herbs. A smidgen, a dollop, a pinch were often the measurements she used. Cooking was for her, and for me by being present and helping her, an art form. Even her grilled cheese were the best, made on homemade pumpernickle with extra sharp cheddar cheese oozing out the side. Weekly shopping meant a trip to the butchers, the fish market, the italian bakery, and to ” Ollie’s”, the market from where she bought most everything else. She had her hamburger ground fresh after selecting a piece of meat out of the case. Fish was most fresh if it didn’t have too much of a fish smell. At the bakery, a certain sourdough that she herself didn’t make at home. This was our routine. I loved it all and I can still see her standing at the counter of one of these shops, wearing her long wool coat and carrying her pocket book with the big clasp. ” Hello Mrs. Edwards, what can we get you today and how’s your neighbor Chris doing?” one of the shop owners might say. Her refrigerator was never without pounds of real butter, sour cream, or buttermilk. 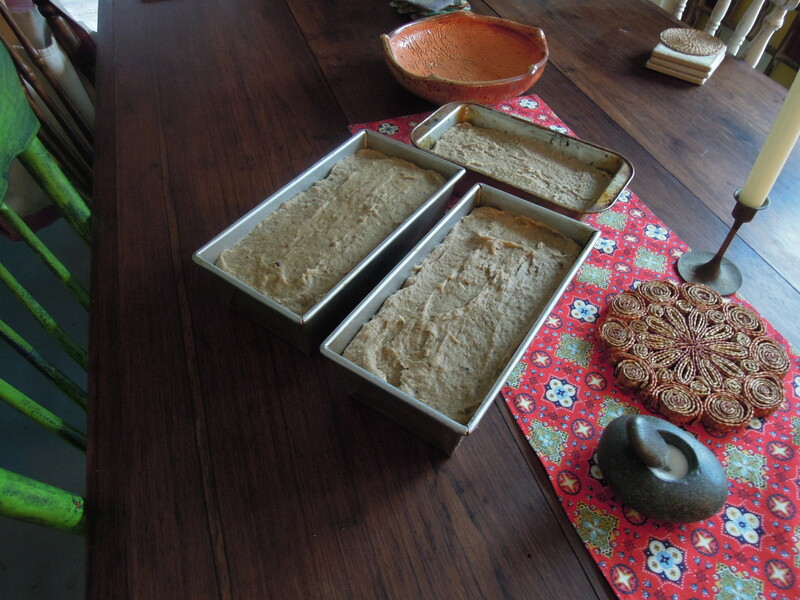 The cupboards were stocked with flour and oats and bran and wheat germ. You would not find a box of cake mix in her cupboard. “Cake Mix” was not a word you’d use at my grandmothers house. If you wanted to bake a cake, you had better start hauling out the butter to soften and make sure there were plenty of eggs and some good chocolate to melt for frosting. Another thing I remember is her quest to find the perfect bran muffin recipe. I ate a lot of them as a result of this. Some had raisins, some did not. 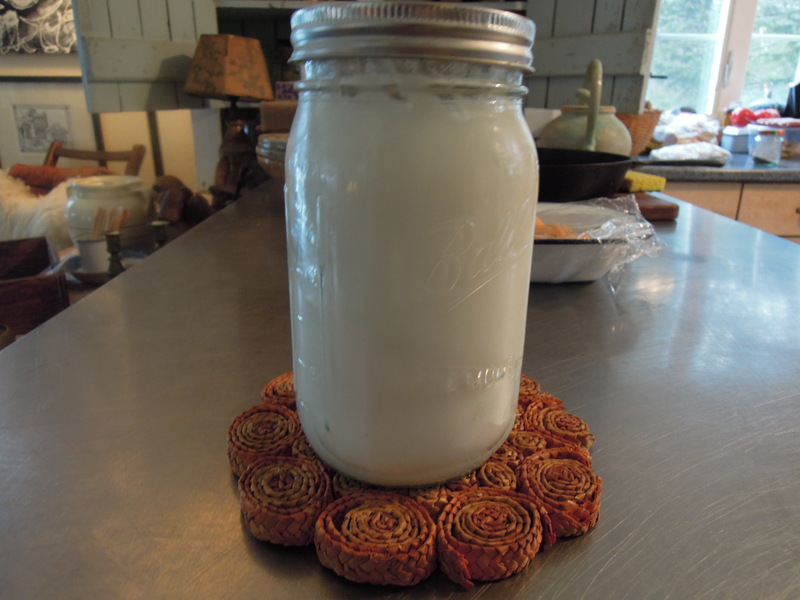 Some called for buttermilk, others requested apple juice or sour cream. 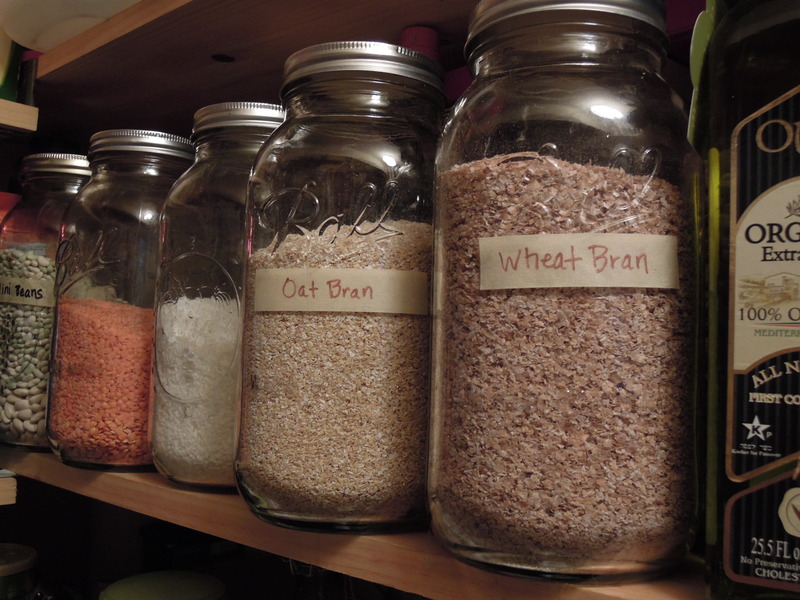 Some used all bran, another recipe called for bran flakes, and then there were the oat bran/ wheat bran/ bran and something-or-other combinations. She tried them all. Some were deemed too dense, too dry, not sweet enough, too sweet, and so on. Slathered with real butter, I thought they were all pretty delicious ( butter tends to help everything). 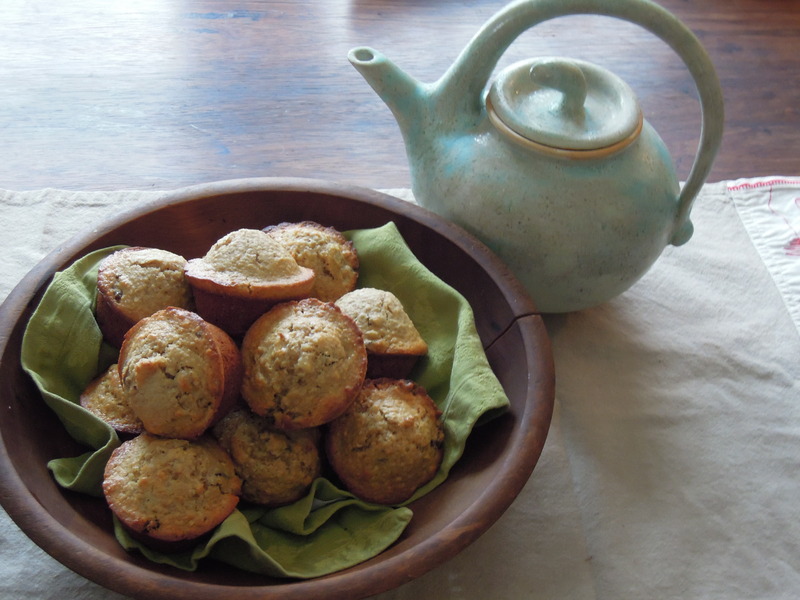 I have not made bran muffins in a long time. Today, I will. I will also share a recipe with you….just don’t forget the butter! I’ll be thinking of my grandmother as they bake. The display garden that got the most attention this past summer, hands down, was the area planted with miniature hosta. Fernwood has a large and varied selection of hosta, we try and have something for everyone’s taste and needs. The mini’s were a big hit this last season. We have some choice selections and created an area just for them, along with some miniature ferns and wildflowers. The mini’s come in many varities. A great selection of colors and leaf texture and are perfect for small spaces. We have planted several into containers with good luck and have had no trouble over-wintering them this way. As many of you know, Fernwood is often a destination stop for hosta lovers (and native plants,too), many of our customers shop to add to an already existing collection. There are hosta gardeners who shop just for the large varieties, the variegated or blue leaf selections, and for specifically named cultivars. The mini’s seem to be getting a lot of attention and requests over the last years and we have been continuing to expand the selection we offer. Some great new Mini Hosta varieties will fill the rows at Fernwood Nursery this summer. Come and see for yourselves! 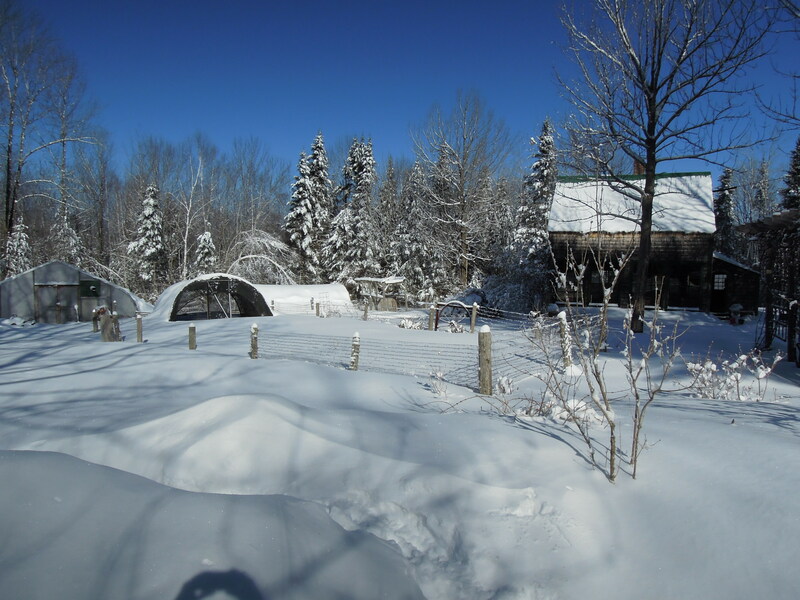 Here at Fernwood, aside from all the plants that are grown, we also raise pigs, chickens, and lamb for the freezer. We do all of our own butchering, brining, smoking, and sausage making. We prefer this, afterall, if we’re going to raise meat for our own consumption, we’re going to see it through from start to finish. This week we were smoking bacon. After curing the pork belly for two weeks in a brine of maple syrup, brown sugar, salt, and citric acid, it was ready to be smoked and turned into bacon. It’s a pretty simple operation. The smoker itself is a large homemade wooden box, with a small front door and removable top. Inside is a homemade woodstove the size of a large shoe box ( maybe a little bigger). At the top of the box there are metal shelves held into position with screws and secure enough to hold the weight of the bacon slabs. The box is not airtight and this allows some air to get in and for the smoke to get out. On one side there is also a small hole to stick a thermometer into, so we can keep an eye on the temperature. We want the box to reach a temperature of about 150-155 degrees, not so hot that it cooks the bacon. Three hours later our bacon was ready…..smoked perfectly and flavored from the apple wood. The bacon is taken out of the smoker, cooled slowly, and sliced into strips. Another years worth of bacon into the freezer! Oh the goodness…… fresh eggs, homemade sourdough toast, and apple smoked bacon. Would you like to join us for breakfast? This week we began the seasons earliest task of starting seeds. Onions, leeks, and all the pepper varieties are first in the lineup. Cell trays are filled with soil mix and then tiny seeds are deposited. Next they are watered ever so gently and then placed on the seed tables in the front room. These early starts are kept indoors until they germinate. We are fortunate to have built the house with huge windows facing due south, perfect for providing the elements we need for tiny seeds to crack open. Within the next two weeks, the big greenhouse will be fired up and all the seedlings will move out there. For now, I am so happy to have that sunlit front room which stays super toasty with the woodstove cranking. With the temperatures we have been having, I cringe when thinking about heating the greenhouse. Yet, despite the frigid cold, we know the sun is high and strong and warmer days are just beyond us. Also indoors, we are using up any vegetables that are showing signs of being stored. Winter squash, beets, carrots, and the last of the onions all finding their way into our daily meals. So, right now, the house is also showing signs of both ends of the cycle. I love that. Like so many who grow their own food or those who garden for the pure aesthetics, bearing witness to this cycle is part of the joy and reward. Arriving back home to Maine with continued frigid temperatures. True, Ireland has just weathered a hurricane that caused flooding and severe tree damage, but there were daffodils blooming and fields turning the brightest green. 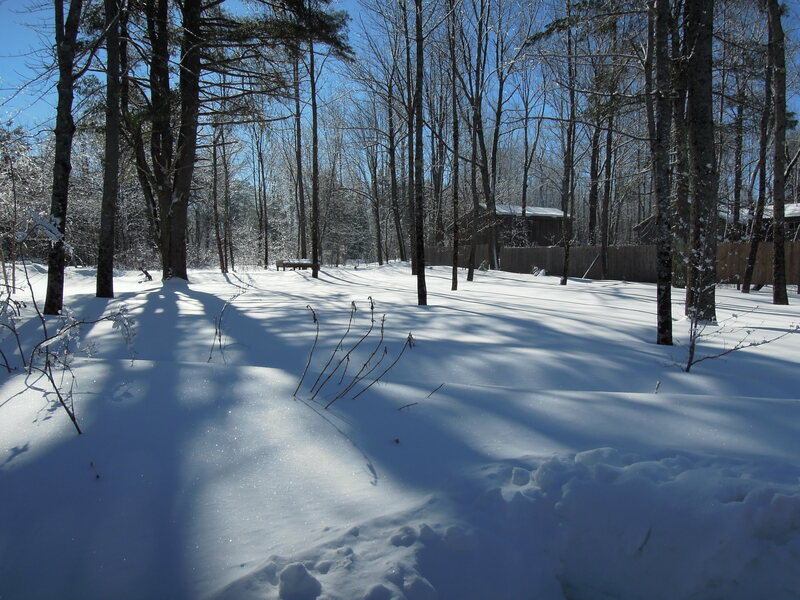 Here……snow, ice, and more below zero temps. In like a lion, out like a lamb, as they say. Let’s just wait and see. 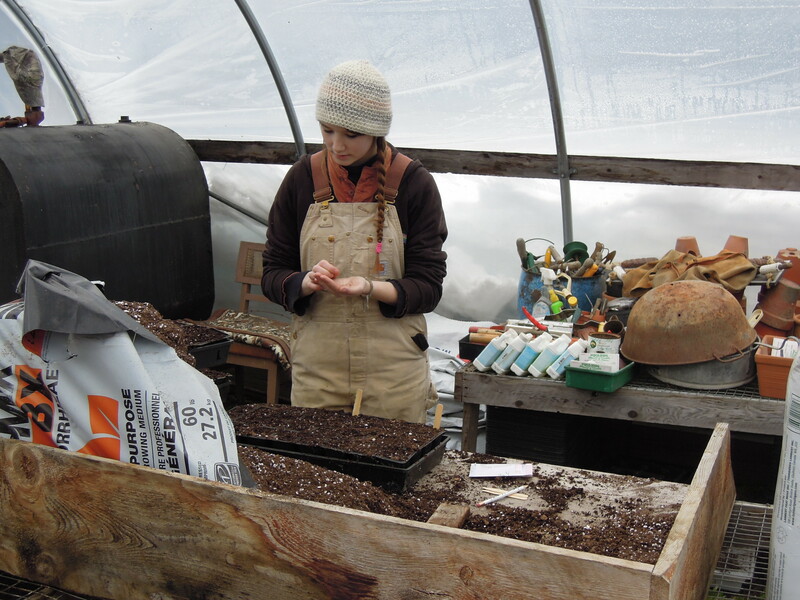 Still, seeds need to be sown and the greenhouse warmed up. And, the maples are being tapped for this years maple syrup supply. We really need some warmer daytime temperatures to get the sap flowing. The pantry and our pancakes depend on it. The month of March is fickle, so I suppose warmer days could be right around the corner. Oh, please!